Zusammen mit Andreas Schmidt hat Christine Kunzmann den Track „Wissensreifung und Organisationsentwicklung“ mit spannenden Referenten wie Ernst Biesalski von der EnBW AG, Marie-Luise Groß von der SAP AG und René Peinl von der IPI GmbH/Hochschule Hof. In this presentation, the application of the knowledge maturing process model to customer projects in a Sharepoint environment is illustrated. It shows the practical relevance and analytical power of the model. Lessons learnt with respect to communication of knowledge management initiatives were summarized. Die Veröffentlichung zu Wissensreifungsaktivitäten und deren Barrieren, die einen Teil der Ergebnisse aus der Interview-Studie von MATURE zusammenfasst, hat auf der Europäischen Konferenz zum Technology Enhanced Learning (ECTEL2010) den STELLAR Stakeholders Distinct Award gewonnen. Diese Auszeichnung erkennt besonders die Kombination aus Wissenschaftlichkeit und praktischer Relevanz an. Christine Kunzmann war hier als Autorin beteiligt. The paper was chosen due to its ubiquity; the work […] can help to address large-scale challenges in the areas of employment, economic success, an organizational competitiveness. Its insights regarding the links between Knowledge Maturing and the practical application of formal education have impressively broad base. […] It was chosen not only because of an interesting and important topic, but also due to its comprehensible language. 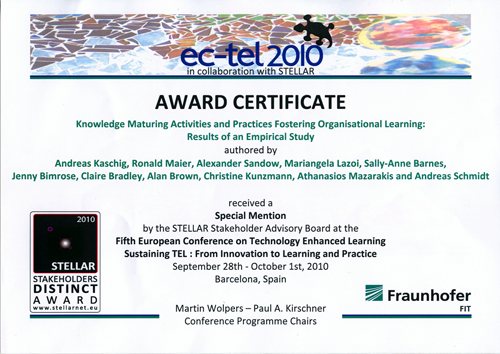 The paper was found to be highly relevant to formal education, continuing development, policy making, and ICT/TEL inductsury. Furthermore, the stakeholder advisory board found it to have high potential with regards to exploitability, scalability, and transferability across Europe, as well as globally. The work described in the paper was evaluated as highly innovative with regards to pedagogical, organizational, and socio-cultural aspects.